Have you written a biography for one of your ancestors? Often it is difficult to know where to start. I see many complaints about the "New Ancestry.com." No automated tool is foolproof and every technological tool needs to be refined. 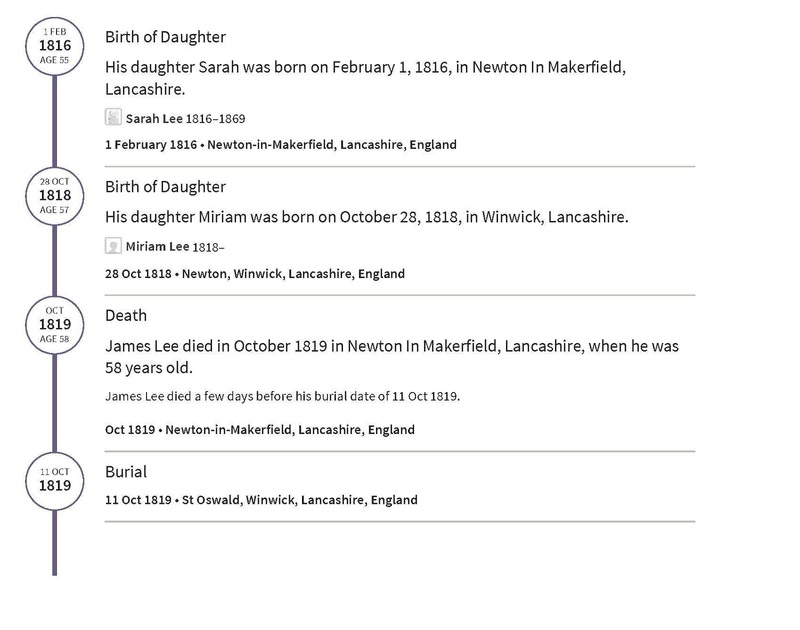 I have seen a few people question the value of the new LIFESTORY view at Ancestry.com. I happen to love the LIFESTORY feature because it eliminates the biographical writer's block. 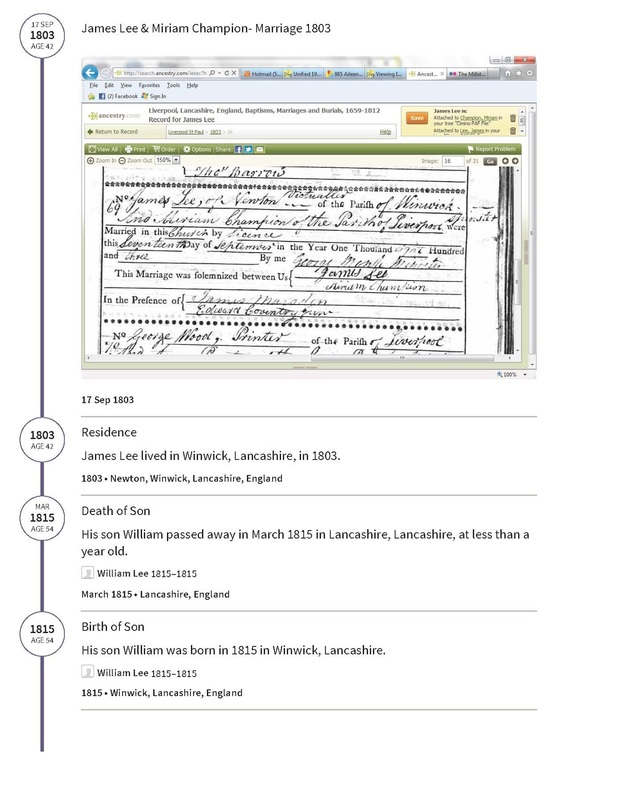 The first step in effective genealogy research is to assess what you already know about a particular ancestor. A chronology for your ancestor is essential to the genealogical analysis. That is why I love using the LIFESTORY feature as a starting point. The biographical sketch and the chronology is already written for you. All you have to do is analyze the accuracy of the story and then edit if necessary. The LIFESTORY can be printed and shared with your family members. This a great way to stimulate interest in the genealogy that you have compiled. 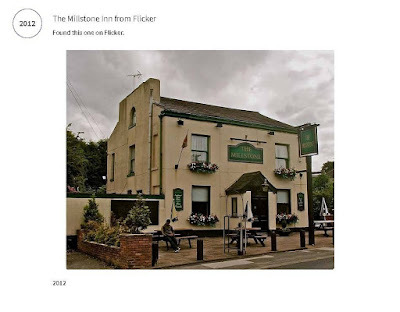 For example, I recently had a conversation over the telephone with my dad about our ancestor, James Lee, 1761-1819, who owned a pub in England called the Millstone Inn between Liverpool and Manchester. Dad wanted to know more about our ancestor and see a picture of the pub which is still in operation. I printed a copy of the LIFESTORY to a PDF and sent it to my dad via email. So here are the images from that LIFESTORY printout. The automated approach of the LIFESTORY presents all of the known facts that I entered on his timeline. The LIFESTORY begins by writing a summary of his life. The name of his father is unknown which is immediately obvious when the automated tool writes that James Lee was "the child of his father". I can edit this paragraph if I prefer that it read differently. The map shows a heart icon for the marriage and a house icon for a residence. a person providing or selling food or other provisions. a person who is licensed to sell alcoholic liquor. I have also seen it described as an innkeeper which fits with the fact that he was known to have operated the Millstone Inn. This page shows more events from his chronology. This page contains a history of the Millstone Inn that I found and a picture from the internet. James Lee was the owner of the Millstone Inn from at least 1803 at the time of his marriage. 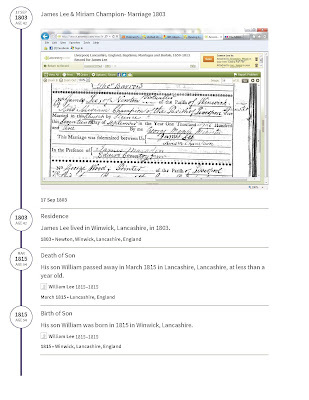 James Lee is described in the marriage record as a victualler. 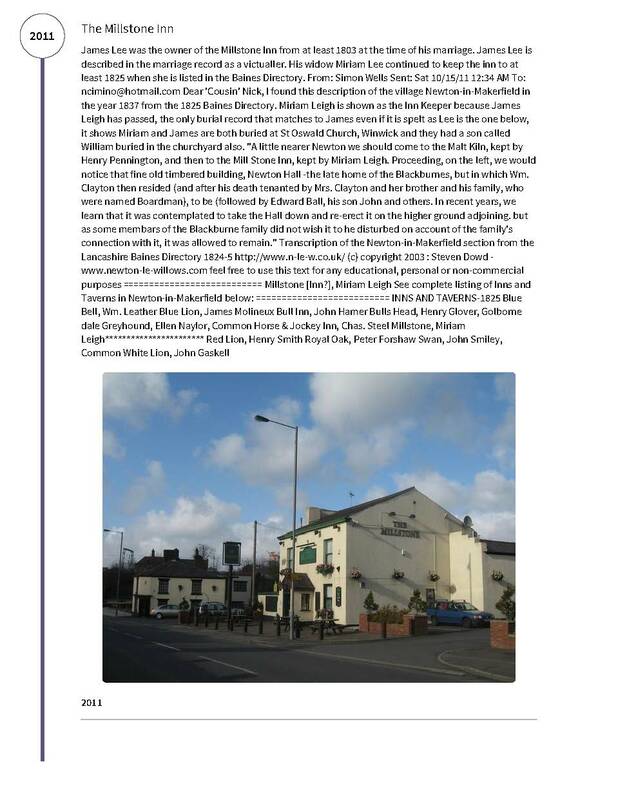 His widow Miriam Lee continued to keep the inn to at least 1825 when she is listed in the Baines Directory. Dear 'Cousin' Nick, I found this description of the village Newton-in-Makerfield in the year 1837 from the 1825 Baines Directory. 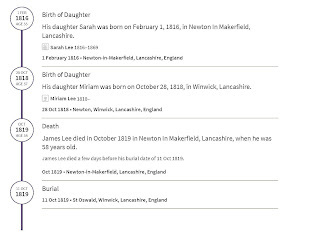 Miriam Leigh is shown as the Inn Keeper because James Leigh has passed, the only burial record that matches to James even if it is spelt as Lee is the one below, it shows Miriam and James are both buried at St Oswald Church, Winwick and they had a son called William buried in the churchyard also. "A little nearer Newton we should come to the Malt Kiln, kept by Henry Pennington, and then to the Mill Stone Inn, kept by Miriam Leigh. Proceeding, on the left, we would notice that fine old timbered building, Newton Hall -the late home of the Blackburnes, but in which Wm. Clayton then resided (and after his death tenanted by Mrs. Clayton and her brother and his family, who were named Boardman), to be (followed by Edward Ball, his son John and others. In recent years, we learn that it was contemplated to take the Hall down and re-erect it on the higher ground adjoining. but as some membars of the Blackburne family did not wish it to he disturbed on account of the family's connection with it, it was allowed to remain." This is my favorite view of the Millstone Inn. I have found the LIFESTORY feature to be a great publishing tool. It also helps me to identify the gaps in an ancestor's chronology. It prompts me to publish the information that I already have and to search for the information that I am missing. 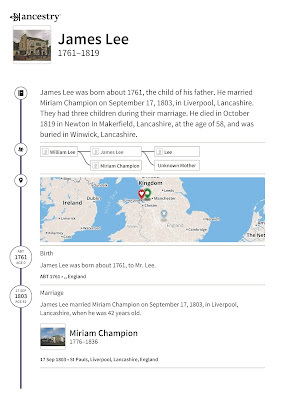 This particular LIFESTORY for James Lee also inspires me to save up for a trip to England so I can retrace the steps of my ancestors and walk inside the building that he once owned!